RacerGISOnline provides enhanced training for seven lab courses from the business section of SpatiaLABS. The program can be taught by faculty with relatively little GIS background. 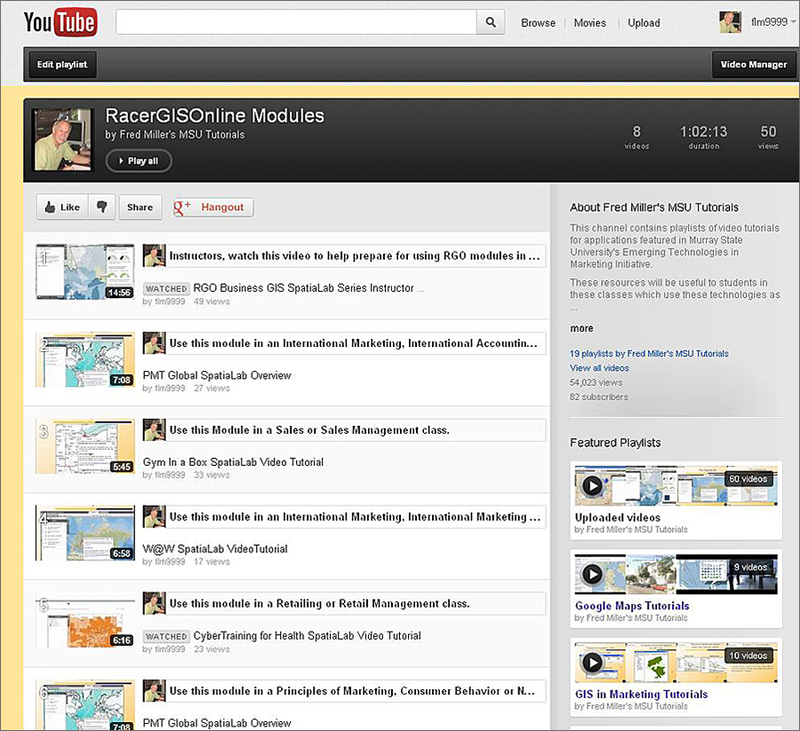 Video tutorials are available on YouTube playlist for ease of discovery and access by interested students and faculty. GIS has proved its value in the analysis and solution of business problems over and over, especially in marketing analyses. However, the adoption and dissemination of GIS tools among executives and marketing managers has been painstakingly slow because a lack of knowledge about its capabilities. So too has been the integration of GIS tools into the curricula of business schools, where instruction in this technology lags far behind its potential contribution to the business decision-making process. To date, this is largely the result of the steep resource curve of GIS systems (hardware, software, faculty training, and so on) that are generally not included in business school budgets. In addition, the traditional GIS lab model requires a significant commitment of institutional and personal resources to develop GIS learning activities that must be subsequently crammed into an already tightly packed course. Easy-to-understand, structured, online GIS instruction can minimize equipment, training, and administrative cost, while supporting classroom instruction. 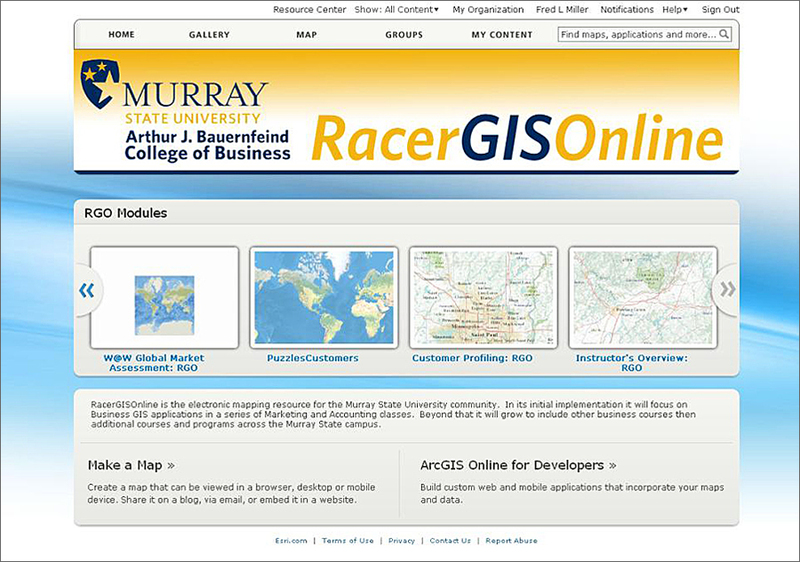 At Kentucky’s Murray State University (MSU), a project team of nine marketing and one accounting faculty members developed RacerGISOnline, a series of online business GIS training modules. RacerGISOnline.org, Murray State University’s funded project in the Esri ArcGIS Online for Education grant program, can be taught by faculty with relatively little GIS background. The program provides enhanced training for seven lab courses from the business section of SpatiaLABS, available from Esri Press. SpatiaLABS are computer-based exercises that supplement college curriculum and present students with a variety of real-world problems that they solve using GIS technology. The MSU program allows students to work through the designated SpatiaLABS exercises using ArcGIS Online, which is seamlessly accessed through RacerGISOnline. A video supplements each exercise, providing additional support without the need for classroom instruction. The video tutorials for these exercises are collected in a YouTube playlist for ease of discovery and access by interested students and faculty. That playlist also includes a general overview tutorial to help students and faculty learn basic functions of ArcGIS Online. The description for each tutorial provides instructions on how to access the relevant map and written instructions in the corresponding exercises in SpatiaLABS. Each module in the series can be finished in 75 minutes or less and used as in-class activities or independent exercises. They may be completed as individual assignments or in teams of two students working on two computers, one computer displaying a SpatiaLABS activity and its instructions and the other computer with the map and its resources. As all exercises are web-based, no computer lab facilities are required. At the conclusion of each module, students are directed to an online survey so that they can evaluate the exercise and its technical components. They also discuss the value of the exercise in class, as well as their level of interest in completing additional modules or taking a business GIS course. More than 50 percent of business students who complete a RacerGISOnline module have expressed interest in taking a dedicated business GIS course. These modules fill different roles in the MSU geography, marketing, and accounting curricula. As they are illustrative applications, geography students will not necessarily expand their GIS skills, but they will see how those skills may be applied to the analysis of business problems. For marketing and accounting students, these modules will often be their first hands-on experience with GIS tools and the application of geospatial thinking to business problems. Because marketing students at MSU have the opportunity to work with geospatial tools in several different courses in their curriculum, the completion of RacerGISOnline modules provide them with a good introduction to the GIS tools they may encounter in other classes. They also become prime candidates for a dedicated business GIS course offered either by the MSU business school or the geography department. 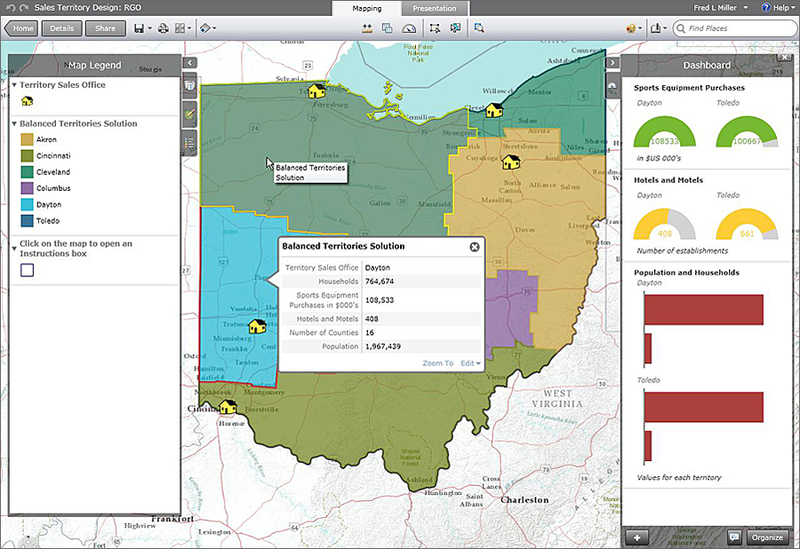 Sample business GIS module map. Following accreditation trends, most business schools and their faculty are seeking opportunities to integrate technology-based, innovative, interactive, hands-on learning activities into business courses. Many of them are high enrollment courses with relatively little opportunity for large scale lab activities. These modules are very useful in that setting, particularly in marketing courses. In addition, by introducing their marketing colleagues to RacerGISOnline business GIS modules and providing support for course integration, geography faculty can build demand for their own business geography courses. Further expansion of the system and its learning resources will include the involvement of faculty in other MSU colleges and schools. Fred L. Miller is Thomas Hutchens Distinguished Professor of Marketing and Business GIS in the Department of Management, Marketing and Business Administration at Murray State University, Murray, Kentucky. He is also director of MSU’s Regensburg Exchange Programs. His teaching and research interests are in the fields of business GIS, e-commerce, emerging technologies in marketing and global marketing management. Miller authored the books GIS Tutorial for Marketing (Esri Press, 2007) and Getting to Know Esri Business Analyst(Esri Press, 2011), and is a contributing author to SpatiaLABS. For more information, contact Fred L. Miller.